Watch Grey's Anatomy Season 5 full episodes online, free and paid options via our partners and affiliates. The fifth season concludes with George making a stunning announcement, Bailey questioning her pediatric fellowship program, and Izzie's fate hanging in the balance. The first of a two-part season finale finds Izzie fighting for her life as Mark and Owen contemplate their future relationships and careers. As Grey's Anatomy turns 100, Meredith and Derek prepare to walk down the aisle as Izzie's condition brings back familiar (handsome!) symptoms. "No Good at Saying Sorry (One More Chance)"
As preparations continue for Meredith and Derek's wedding, her father returns to make amends. Izzie receives a visit from one of her estranged parents, as well. Izzie plays wedding planner to take her mind off her treatment, while Callie introduces Arizona to her disapproving father, and Owen seeks help for his PTSD. Derek returns to the OR after his meltdown, while Izzie's condition requires her to undergo an operation of her own. Cristina and Izzie debate what do to next, while Mer attempts to get Derek out of the woods and back to work. Derek decides to quit, but Meredith refuses to give up on him. Bailey and the Chief continue to bicker, while Izzie's interns discover something unsettling. Derek and Addison square off yet again - this time with a patient's life in the balance. Bailey, meanwhile, is stunned by Richard's recommendation letter. Addison, Naomi and Sam rush to Seattle Grace with Archer and reunite with old friends Derek and Mark. Izzie employs her fellow doctors in a medical game. Owen runs into someone from his past. In "Beat Your Heart Out," Derek searches for the best way to pop the question to our girl, while Little Grey wants to go public with Big Sloan. As a patient's condition becomes more and more dire, Bailey becomes more and more desperate to do something - anything - to save him. Death row inmate William is still around and he's shaking things up, while Derek's mother comes to Seattle Grace and meets Meredith for the first time. Dr. Yang is forced to give up the coveted solo surgery, while sparks between Mark and Lexie possibly heat up. Why the heck are the interns cutting themselves? And why the heck is Izzie still seeing Denny? And what happens when it all goes wrong? As if this season weren't turbulent enough, it's time for a couple of newcomers - Harriet Dixon and intern Sadie - to make their debuts and shake things up at Seattle Grace. 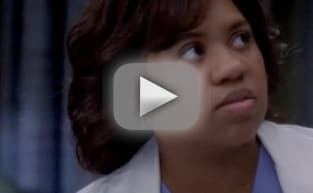 The sudden revelation that this is Brooke Smith's (Erica Hahn) last episode has dominated the discussion and speculation of this episode so far. Empowered by the Chief, Bailey has new responsibility and the new head of trauma - Owen Hunt - is shaking things up at Seattle Grace. "There's No 'I' in Team"
Mark talks with Callie about love. Seriously. Bailey heads a risky surgery - even by Seattle Grace standards. Derek gets sole credit for a tumor study he and Mer did. Meredith freaks when Derek discovers her mother's diary, Callie preps for a date with Erica, and Cristina stumbles into a new part of the hospital. In case the title didn't give it away, Seattle Grace is hit by a flood in this episode. Or more accurately, a plumbing fiasco. Izzie: They tried number 9? Who does 9? Sadie: Well personally I'm a fan of 5, 7, 8, pretty much 12 through 20. Meredith (laughs): I would try 15. Izzie: Don't. Don't try 15. I would try 16. Yeah. I've never done that before. Lexie: Um, don't do 16 too fast. It can hurt badly ... I heard. Grey's Anatomy Sneak Preview: "Stand By Me"
Grey's Anatomy Round Table: "An Honest Mistake"
Grey's Anatomy Round Table: "Stairway to Heaven"